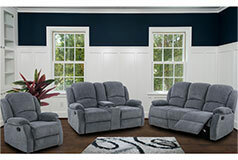 The Crawford Reclining Living Room Set is designed for families who love to entertain. 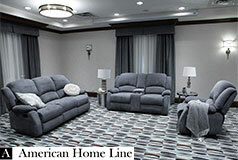 Designed with clean lines and it’s upholstered in a gray polyester chenille fabric. The three-piece reclining sofa set comes with a reclining sofa, a reclining loveseat (with a storage console) and a reclining chair. Every person can sit back and relax in style. You’ll be full supported regardless if you’re sitting upright or reclined. The Crawford is stuffed with billowing pillow arms, back and seat cushions for maximum comfort. Key Features: This reclining set lets you recline in the position that’s most comfortable for you by using the manual latch located on the side of the sofa. (Note that the middle seat of the sofa does not recline). Chair: L 36" x D 36" x H 40"